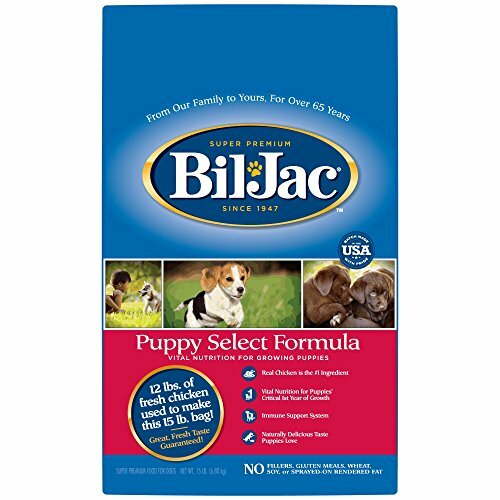 Is Bil Jac a super choice for my puppy? Puppy mums and puppy dads, so lovely to see you here again! We’ve prepared a lovely Bil Jac Dog Food Review for you about one of the potentially less well-known dog food brands. Let’s find out what Bil Jac are all about, and what they’ve got on the menu for our special friends! What makes Bil Jac special? 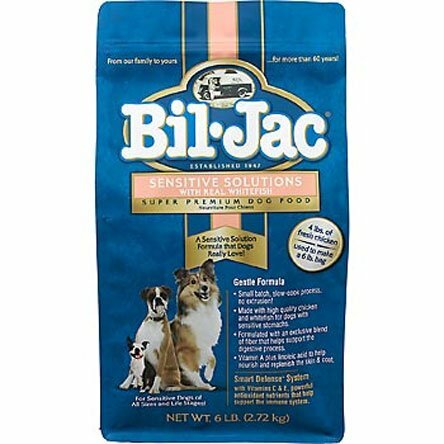 Why the Bil Jac food reviews and Bil Jac puppy food reviews? Can I give my puppy raw meat? What is BHA in puppy food? Bil Jac are an Ohio-based family company. They have a serious stance about using real chicken as the top protein ingredient for our puppies and dogs because for over 65 years they have been striving to give our best friends all the nutrients that their carnivore ancestors needed for survival and fitness. 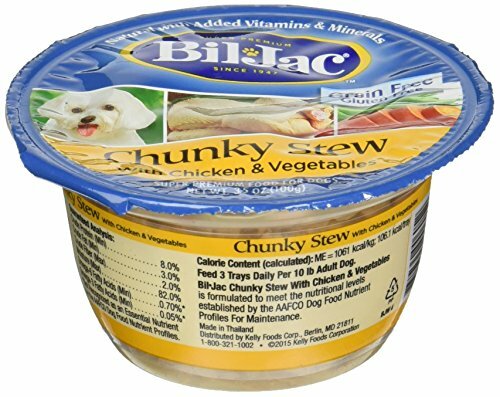 Bil Jac also started selling their dog food out of their own kitchen, which is pretty neat. They are still family-owned and run, which makes it more impressive that recently the brand has become more recognized worldwide, especially in markets such as Korea, Japan, Canada, and Chile. 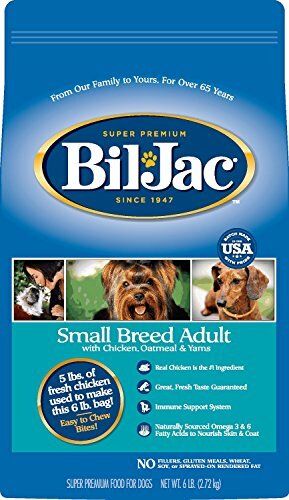 Well, Bil Jac state that 5 lbs of chicken go into every 6 lb bag of puppy food. Now that’s pretty impressive, if you ask us! Interestingly, they make frozen fresh meat-based dog food and treats, which includes options that you can serve right after thawing it. The brand also features whitefish in their sensitive tummies range, which helps with immune support. Vitamin E and Vitamin C alongside this also help to keep your puppy or dog from adverse reactions to their food. They also offer some weight management recipes, which can be good for grown dogs who have put on a few pounds, to keep them at a healthy and recommended weight. 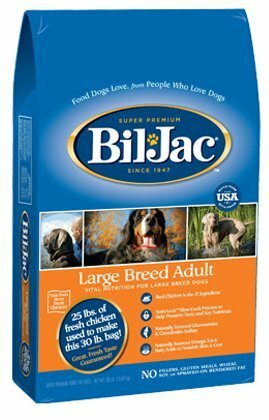 Bil Jac make special puppy food and dog food for our large, small, and medium canine companions. This always makes it a little easier to pick out the right dog food, given that a carefully crafted size-specific formula will tend to have the nutrients that are required for staving off common health conditions. Within their larger puppy and dog formulas, Bil Jac features chondroitin and also glucosamine to help combat the more prevalent joint problems. Their recipes for smaller puppies and dogs have smaller (mini!) kibble sizes, as well as a slightly higher energy content. Their special proprietary Nutri-Lock system is potentially a beneficial approach of cooking ingredients that is softer on doggy tummies. So, let’s have a little look together at how Bil Jac might help your puppy or dog live a healthy life and have some happy, tasty mealtimes! 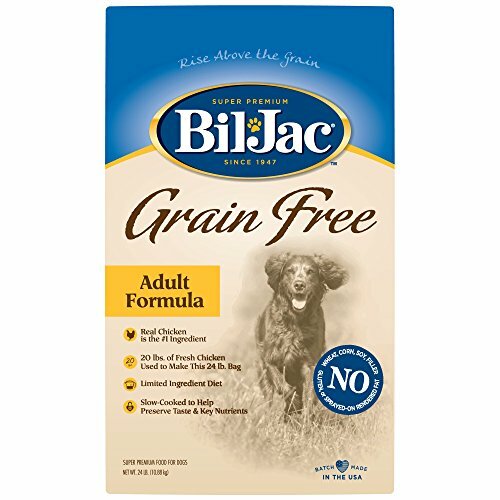 Bil-Jac Grain Free Adult Dog Food, 24 lbs. Bill Jac’s grain-free formula has zero cereals, but lots of lean protein from authentic sources such as chicken. It’s well-suited to grown dogs of all sizes, from tiny Daschunds and Yorkies to giant St Bernards, Rottweilers, Great Danes, and Dobermans. Pea fiber helps to keep digestion smooth and easy-peasy! There are very few common allergens in here besides chicken, so all around it’s pretty great. We like this very much, we’re always pretty happy when a dog food brand offers a great gluten-free option. Bil Jac does this well, keeping protein high by using real, natural sources of meat, and pea starch for energy, too! Like all good puppy foods, this small breed recipe is all about high protein and high fat. As it’s designed specifically for smaller pooches such as Chihuahuas, Yorkshire Terriers, Pomeranians, and Dachshunds, it packs in lots of energy for a super-quick and intense period of growth. Blueberries, apples, and cranberries will all give antioxidants and vitamins to your little pup! Has by-products of chicken, although, as we’ve noted before, these are intensely protein-rich. With 412 kCal in each cup, your small puppy will be getting good amounts of energy at each of their 3-5 daily recommended meals. Smaller teeth need smaller, bite-sized pieces to chew on, and that’s another reason why we like this size-specific Bil Jac kibble for little dogs. Bil Jac’s Puppy Select is probably a super convenient choice for you if you’re the proud owner of more than one different sized puppy. It’s developed to offer a comprehensive, all-around balanced diet to all pups of up to a year young. There are a lot of vitamin supplements in here, alongside minerals such as copper, iron, manganese, potassium, and zinc. Includes by-products as both meal and organs. There aren’t any real fruits or veggies that we can spot in this formula, but we’re pretty happy with the fat, protein, and other macronutrients that are all present in the recommended amounts. This puppy food recipe also includes oatmeal for both protein and soft, smooth, trouble-free digestion. Four out of five stars! Here’s one awesome chicken meal for you larger puppy owners- well, for your puppies! You’ll find that this has slightly lower protein than the small puppy breed dinner, which is just fine, as bigger dogs will grow slower. Same goes for the 17% figure for fat, although this is pretty much at the higher end of the recommended daily fat for larger dogs so you’ll need to take him out exercise and fun! 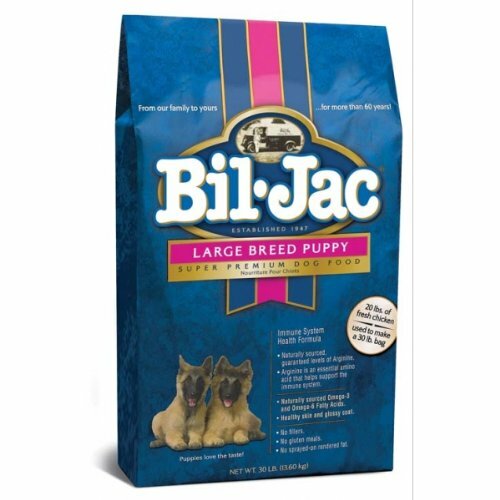 Lower calorie content per cup than the Bil Jac Puppy Select and Bil Jac Small Breed blends- perfect for larger puppies. You’ll see that there are by-products such as organs and meal in here, although they do provide glucosamine. With glucosamine to help with healthy joints, fewer kilojoules and calories in each cup, and a whole range of different minerals, there are a lot of good things to say about this large breed puppy food. Although the label boasts less fat than the Puppy Select version, we’ve noticed that this is only 1% less. Oh well, more excuses to romp around with your puppy! This tasty-sounding stew features egg and chicken as two key protein sources. There are some real veggies in here too, for a balanced and complete adult doggy dinner. Now for those veggies- this stew contains both sweet potato and peas for a mix of protein, vitamins, and softly-digestible fiber! There is some potato in here, so not for dogs who aren’t able to take in any potato. While we can’t 100% guarantee that this hearty stew doesn’t contain gluten, we don’t see any grains. Tapioca starch is gluten-free if not cross-contaminated, so have a quick check with your vet, if you are unsure, but otherwise, this looks like a great dinner for dogs of all sizes (and dogs of all shapes, yes!). Five stars out of five! Classic chicken is the primary protein source in this kibble for all-grown-up dogs. It’s also specially crafted to feature glucosamine because our gentle giants can always do with this extra boost to help combat any joint issues. Perfect for all larger dogs between 50 lbs and 120 lbs. Woof woof! Contains corn, so not OK for dogs who need to be on a gluten-free diet. By-products do have some advantages of their own. In this case the fact that they are a rich source of glucosamine, which helps to reduce the risk of hip dysplasia, cartilage degradation, and osteoarthritis in larger dogs. And this formula’s definitely designed for big dogs, such as Great Danes, St Bernards, Mastiffs, Rottweilers, larger Huskies, and German Shepherds. Sensitive Solutions refers to the need for some of our adult dogs to stick to only what’s easily digestible. This dog food’s designed for canines of all sizes who could benefit from a healthy immune system, such as those with intolerances or a tendency to be sensitive to certain foods. Vitamin A will work together with linoleic acid to take good care of your dog’s first line of defense- his skin. Seeing as it is made with corn meal, it’s no good for dogs who need their diets to be gluten-free. Grown dogs aren’t always going to require up to 26% protein, but that’s one of the reasons that this Sensitive Solutions blend is so great for all breeds- it meets the higher recommended protein requirements for muscly breeds such as Rottweilers and Pit Bulls. We see heaps and heaps of minerals in here too, which is always a big plus. There are two schools of thought regarding whether or not it’s alright to feed your puppy or dog with raw meat. On one hand, those owners who believe it’s a good idea will often argue that raw meat was the diet of our canine friend’s ancestors. This much is true, for sure, and if you’ve got a Husky, you probably won’t have a hard time imagining him chowing down on some tasty steak between his sled runs! Other advantages that supporters of raw diets often cite are better dental health, skin, and all-around higher energy levels. On the other side of the fence, there are quite a few vets who believe that puppies and dogs shouldn’t be eating raw meat for pretty much the same reasons that humans shouldn’t. These include the potential risk of bacterial infection and the danger of choking and digestive tract damage that can come along with eating anything that might contain whole bones. It’s even been argued that raw meat, eggs, and so forth will contribute to dietary imbalance if fed to your dog for a long time. BHA is a synthetic (lab-developed) agent for preserving your puppy or dog’s food. You will find this in some kibbles like the one we’ve included in our Bil Jac puppy food review. It preserves by acting as an antioxidant, quite like Vitamin E, which is all-natural. There are always pros and cons associated with the use of chemical agents for preservation. With BHA, and with BHT, another common add-in, these have been shown to act as carcinogens (cancer-causing chemicals) in studies of rats. On the plus side, they will keep your puppy’s food preserved for longer than the natural alternatives of things like citric acid, Vitamin E. All manufacturers have to state whether they include these ingredients within their dog foods, so that you can make an informed choice for your fluffy friend.